First of all, we want to thank Korean Table All Ban Restaurant for having all of us over for such a wonderful spread of dinner. It was beyond wonderful to be part of your soft launching! 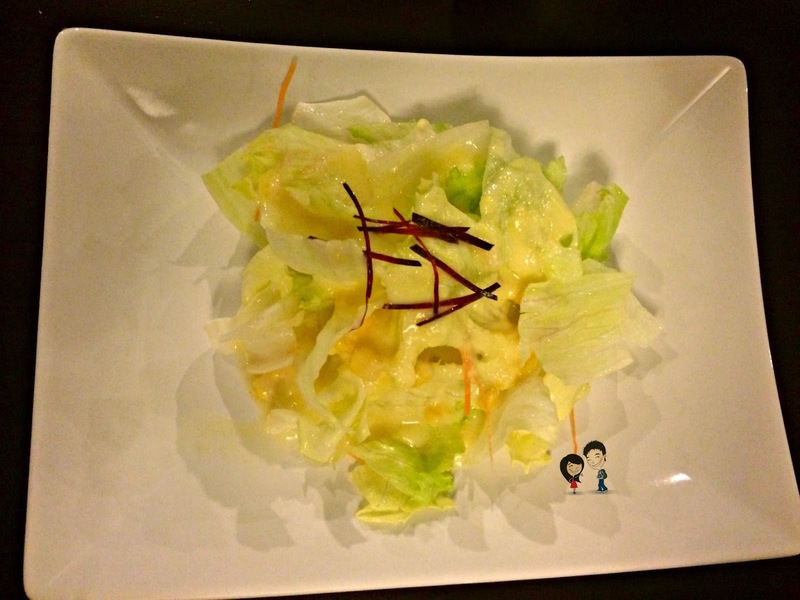 Korean Table All Ban Restaurant is Penang's first fine dining Korean style! Yep, you see that right. 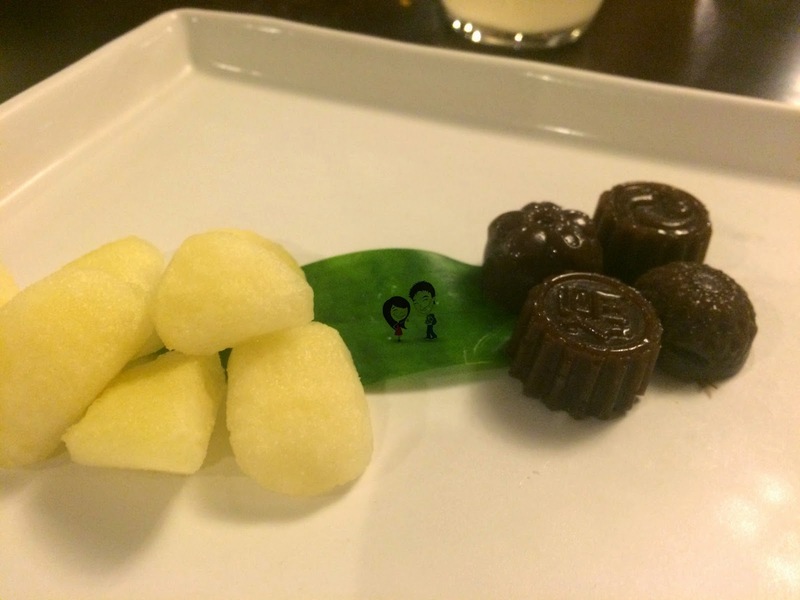 Fine dine anyeonghaseyo style. We were both excited to try it out as this will be both our first time. This restaurant is opened and managed by a mother-daughter team. Needless to say, mom, Ms Yang Hae Ree is the head chef of the restaurant and daughter, Alice is the manager of the place. The family is fully Korean, migrated to Penang many many years ago. With that history and more stories being told to us, we knew that everything that we were going to taste were going to be 100% Korean. Excited already okay! 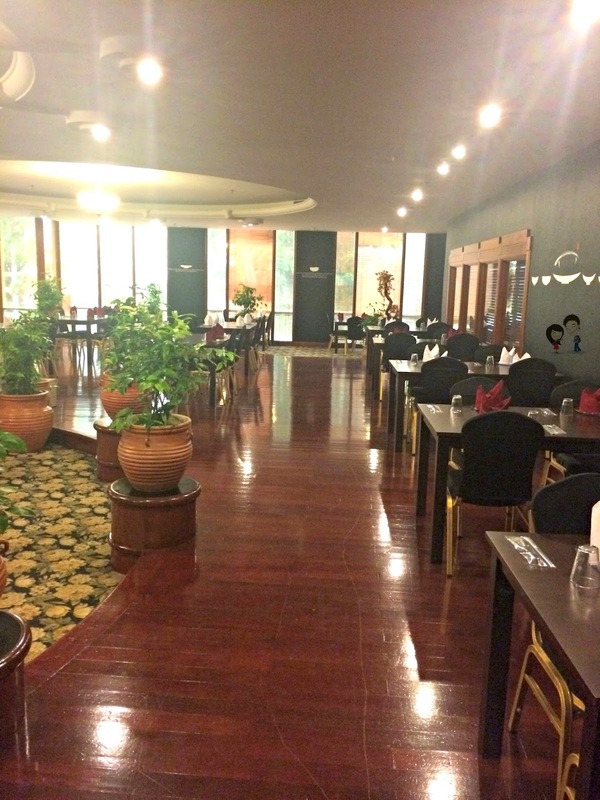 We were all served with a set of fine dining meal, which you can enjoy too at the price of RM29.90 per person. Prices are exclusive of beverages. Food items that you will get for that price are as below. 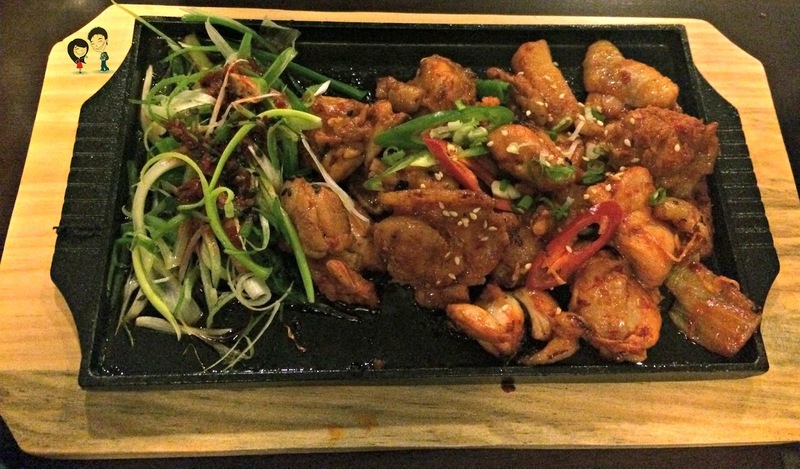 If you would like to have more items such as stir fried octopus and ginseng soup, then the set meal would be RM39.90. This time, we have six special guests (all Korean food fans unite!) 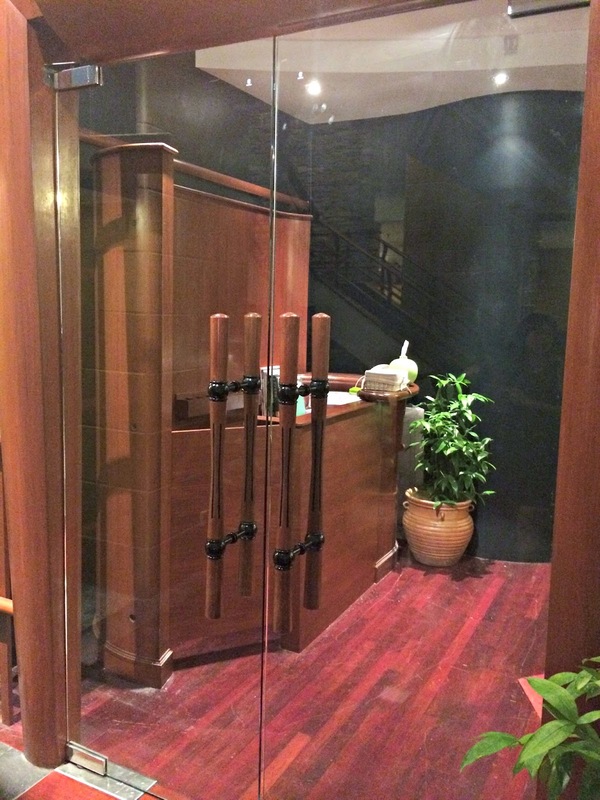 who will also be commenting on the food review at Korean Table All Ban Restaurant. Enjoy reading all our reviews! From left: Andrew, Adrian, Sarah, Alice, Ms Yang, Jelissa, Melissa, Tracy and Ee Lynn. James is missing from the photo because he was the photographer. Simple set up for a Korean dining experience. He says: Looks like soya milk, tastes like tuak! This rice wine is sweet and I could go back for this. She says: Surprisingly, it tastes so mild and sweet. A must try! Andrew says: Sweeter than white wine. To me it was okay, not strong at all. Ee Lynn says: Ask alcoholic Melissa Hoo. HAHAHAHHAH! James says: For a beer lover this drink comes out a little too bland. A little sweet aftertaste with rice residue when you drink it. Not a strong alcohol but good for an after meal drink. Kinda like drinking tea. Jelissa says: Ask Mel, she drank mine. Haha! But in all honesty, I'm no expert on alcohol so I can't say much here. Melissa says: Sweet and nice. The alcohol taste was not too strong. Tracy says: If you are a fan of sweet wine, you outta give this a try. 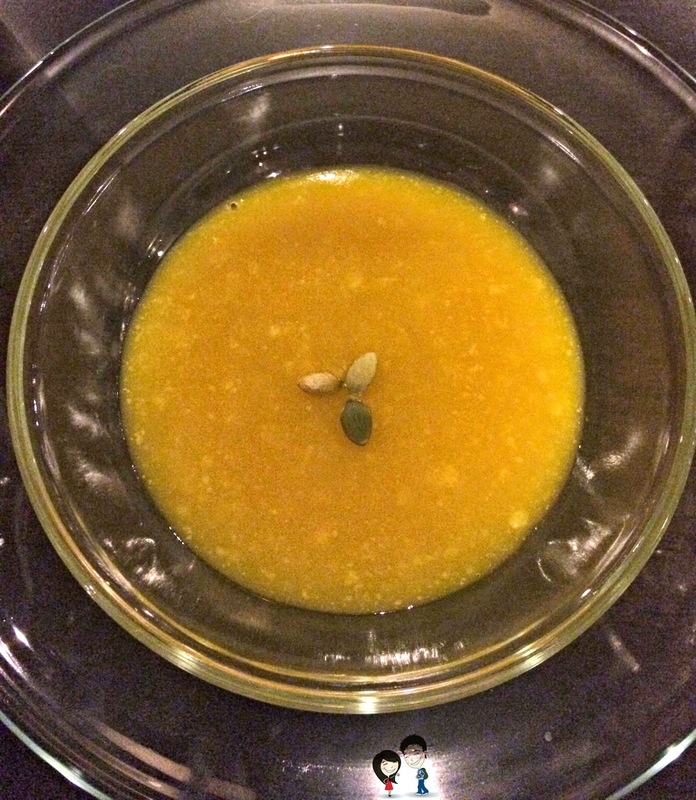 He says: Taste like.. a combination of pumpkin soup and porridge? The taste wasn't so strong compared to pumpkin soups but special somehow! She says: The texture is thicker than normal soup. It's like in between porridge and soup kind. Not a big fan of pumpkin but this one not bad. Andrew says: Never really a fan of pumpkin soup also I think it was a little too much for me. At first taste it was okay, but later on I just wasn't into finishing it anymore. 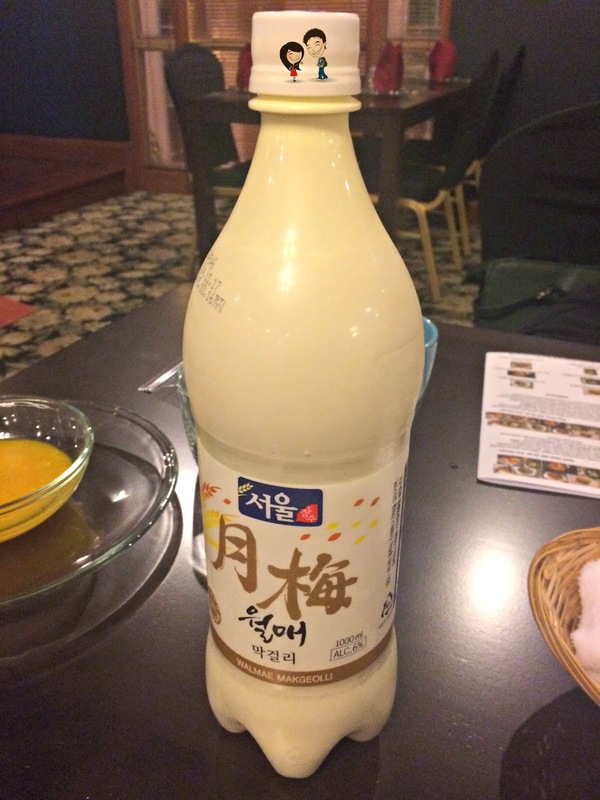 Ee Lynn says: Also something I've never tried before... only see it a lot when I watch korean series.. always wondered how it tastes like.. super refreshing. Jelissa says: Thick and creamy. But taste a lil too plain. Perhaps the serving was a lil too much for me. Would be good if they have more than 3 melon seeds in it? Hehe! Melissa says: Okok only. Nothing much. Tracy says: Texture like pumpkin puree. Not really a fan. Fresh salad with pineapple, corn and sesame dressing. He says: Not a fan of salads but this one is not bad! She says: I thought that the pineapple and corn dressing was really unique. It's sweet and very fruity. Not quite sure whether I like it or love it. Heh. Andrew says: This dish was fresh and flavorful. The dressing is definitely the highlight for this dish. Ee Lynn says: Salad was refreshing. James says: Lettuce and beet root.. a good healthy combine. The light dressing makes it all tasty. I'm guessing if you're not a green lover you wouldn't touch this. Jelissa says: Well, the veges were crunchy and fresh. The highlight was the salad dressing. It's got corn in it I think. But nothing too extraordinary. Melissa says: Just like the ordinary salad, but the sauce was really nice! Tracy says: Pretty much like a normal salad. She says: This is a tough one to pick. ALL THREE were amazing. All has its own unique flavor to it and the thing about this dish is that I could just keep having them without feeling like its too much. ONE OF MY FAVORITE for sure! Andrew says: Tried all three, loved all three. Don’t really need the sauce that was given to compliment the pancakes. All three pancakes alone tasted real good but the sauce isn’t that bad as well, but I would prefer having it without the sauce to actually taste the pancake. 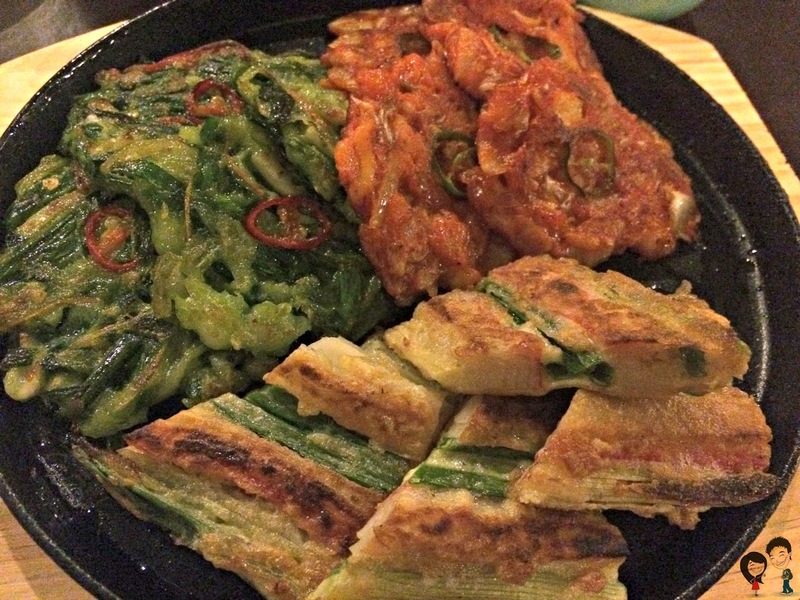 Ee Lynn says: Only tried the kimchi pancake in other restaurants. Really like that we can try different sorts.. and it's in small bite sizes! Like in korean series! super yummy and smelled damn good. James says: Crunchy pancakes made with 3 different kinds of veg exploding with flavor. I would finish 2 plates of rice with just this dish alone. That will tell you how good they are. Jelissa says: Not sure if they serve all 3 types to everyone as well? But I was lucky to get to try all 3! My favourite was the spinach one, crunchy outside, soft in the inside. Actually they're all like that but the spinach's a lil more to the sweet side while the kimchi one, sour-ish. I forgot the name of the sauce they gave but that definitely added some yummy points! Melissa says: Very very delicious pancakes. Texture and taste were perfect. Tracy says: These mini size pancakes that came in 3 different flavours and I must say they all taste so delicious! He says: Thumbs up for this. Fresh, cold and sour at the same time. She says: It's really crunchy and fresh. I love the taste of the paste but not so much on the freshness. I could taste the raw-ness of the cabbage and probably that's why I would prefer those fermented ones. Andrew says: If you ask me, I actually prefer this FRESH kimchi instead of those fermented ones. The soury taste isn't there but it is so fresh that it compliments every other dish. I had it wrapped together with the grilled chicken dish. James says: This isn't your regular Kimchi. Freshly made by the day, You won't really taste the fermented cabbage and the smell isn't that strong. So for those who do not like kimchi for the smell, you'd love this one. Jelissa says: I would personally prefer sour kimchi over this one. This is not sour at all. While it has it's uniqueness, I think the seasoning and the veg was not thoroughly soaked through. 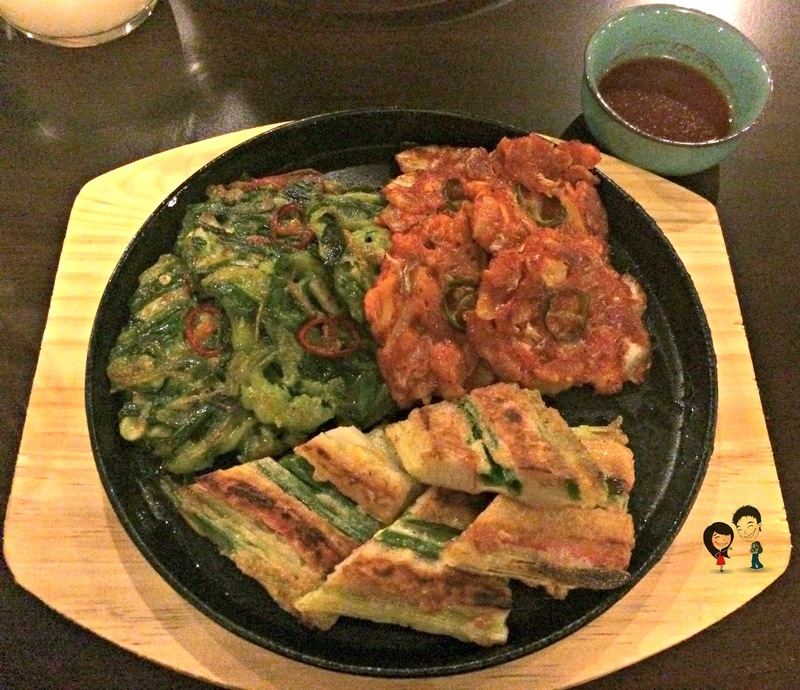 Taste as if they were two separate items- veg dipping in kimchi sauce. Or maybe that's how it's meant to be? Melissa says: This is sooo good! Crunchy, fresh and not too sour! 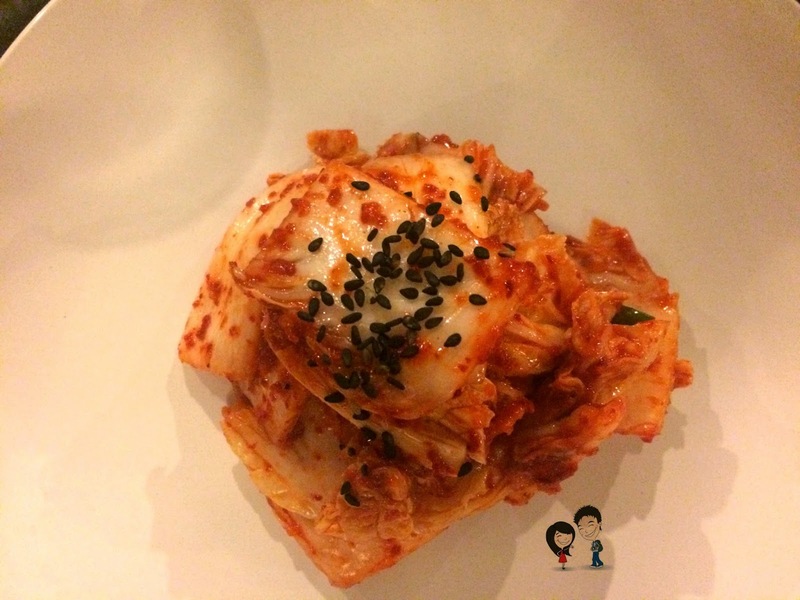 Unlike other kimchi you have from other restaurant! Highly recommended! I’m hooked! Tracy says: Fresh and crispy kimchi. Not too sour. I'm generally not a big fan of kimchi but i reckon kimchi lovers would approve. He says: HAHA! 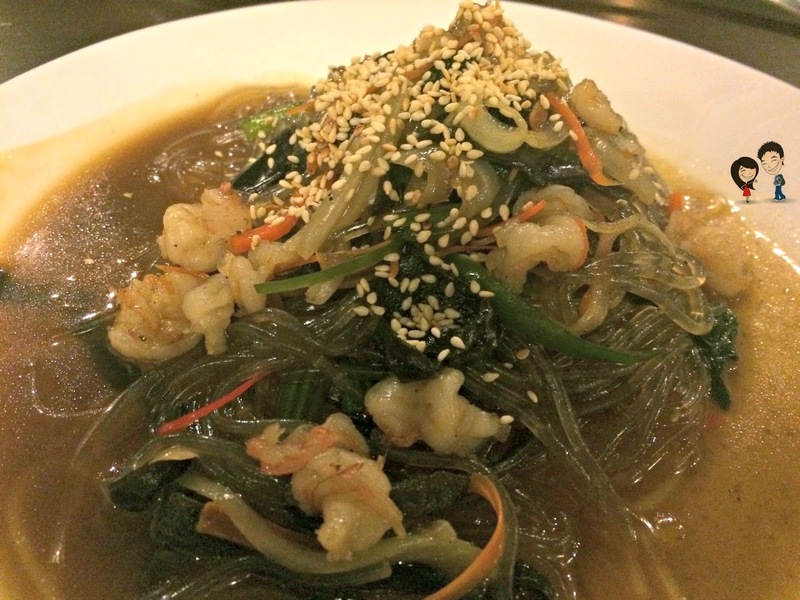 My favourite Korean dish =) Springy enough and the taste is flavorful! She says: The glass noodles were soft but not to that extent of too mushy and the flavor of this dish is not overwhelming. Overall, quite a yummy dish. Andrew says: I think this was the most chinese dish in a Korean Restaurant. Am not complaining though, it was so good that I could have finished the whole plate myself. Ee Lynn says: The stir fried tanghoon thingy damn good. noodles are so springy. different from what I usually taste in other korean restaurants. James says: Chinese and glass noodles, seem to bring blessing when you have it on your birthday, but this time around I'll make an exception. I"m kidding I love glass noodles, this dish really has the flavors mix in your mouth with the natural sweetness from the other ingredients complementing each other Makes it perfect. Jelissa says: This was mouthwatering and yummy. Though it doesn't feel Korean-ish but good nonetheless. Melissa says: Ooooh…this was really good. The noodle was really springy and tasted just nice. Tracy says: Well seasoned. Really good. Noodles were nicely cooked. He says: A very special yet interesting dish! At first glance, I thought this will taste like ginseng or herbal chicken soup we have at home but no! 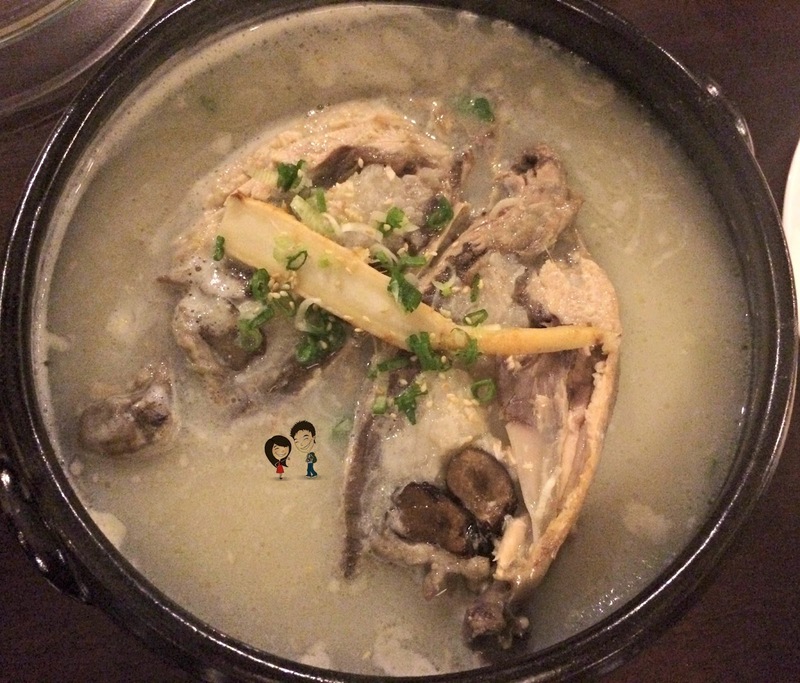 , the soup has a very very light ginseng taste, almost like hot water! The cool thing is that when the chicken is dipped into rough salt, it became tasty! She says: Got glutinous rice inside the chicken okay! The meat is crazy soft! Don't have to put energy whatsoever sure can get a whole bunch by just putting your fork into it. MAD SOFT. The soup was served bland on purpose because it's healthy like that. This dish was served with sea salt at the side so you just gotta dip the chicken into the salt and eat. Amazing effect. Amazinggg. Chinese people will find it hard to love the soup because we're the kind who loves strong flavored foods. Andrew says: I thought I was sick and it caused my tongue to not taste anything from the first spoon of soup I put into my mouth. Then there was the salt that made sense to the tasteless soup and chicken. Something bout the salt though, it doesn’t taste like normal salt, it made the dish a dab more flavorful. The chicken was nice even without the salt though its tasteless, maybe its because of the soft texture. Ee Lynn says: Very nice. super interesting. first that I've ever tried in Penang.. eating it with the um.. healthy? salt brought the experience to a whole different level.. super loved eating it with the fresh kimchi. 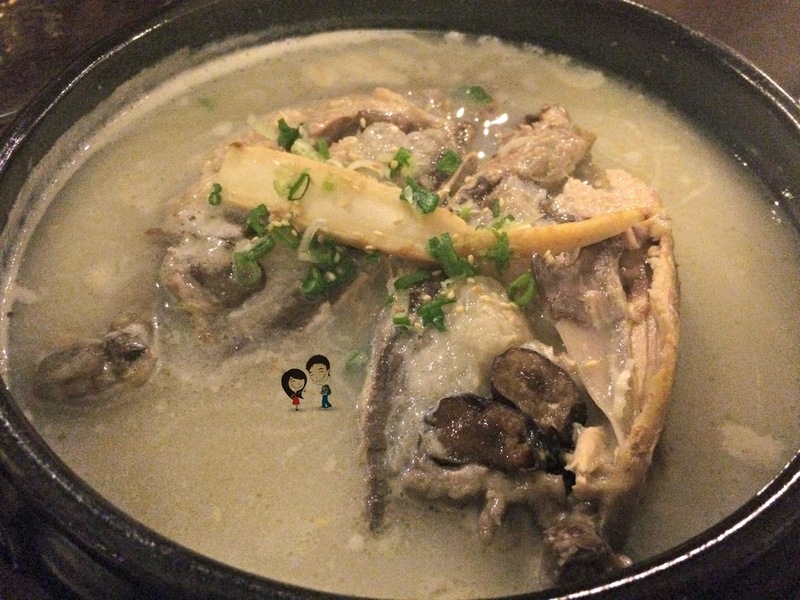 James says: The Ginseng Chicken soup isn't something a taste fanatic would appreciate at first, but cosidering the health content you might give it a second go. With natural salt provided for you to dip in for that little extra flavor if you like it salty. Jelissa says: The soup itself was quite flavourless but I guess the main specialty was the chicken with glutinous rice in it! I like the part where we dab a lil course salt on to the chicky. The salt itself isn't too salty like the usual salt, just nice to add a lil flavour to the meat. Salt actually smells nice & natural, like the sea! Melissa says: At first it tasted a lil bland, but then slowly the the fragrant from the chicken soup just started seeping through. The soup was really thick and could really taste all the chicken soup goodness! Tracy says: This was certainly a pleasant surprise. Chicken was served alongside with unsalted soup. We were asked to dip the chicken meat into a bowl of rice/salt, then consume it with the soup. By doing so, it brought out more flavor of the dish. Thumbs up! He says: Making me sing "everything is awesome"! She says: Chicken tender and marinate sauce superb. Lovely dish. perfect with a bowl of white rice. Andrew says: This one tasted a lot like satay to me and I don’t know why. How is this a Korean dish is still a mystery to me but nonetheless it was very delicious. Added wrapping with the kimchi, SUPERB! Ee Lynn says: Barbequed pork is it? Very nice and smelled super good. again, different from usual korean restaurants. James says: And finally.. the best for the last. Grill and chicken.. what can go wrong? Well cooked to that golden brown we all wish we had done the same with our chicken dish at home. with the added peppers for not just garnishing but that tinge of spiciness, really brings out the whole dish. This is the one you eat with lettuce and the side dishes. Jelissa says: My favourite! Juicy chicken meat, flawlessly marinated. I could devour the whole plate all by myself! Unbeatable! Melissa says: This is delicious too! The meat was tender and it tasted so delicious! Wrapped with vege and the sauce. Yummy! Tracy says: Juicy, tender, caramelised chicken. Yum. He says: Complements the whole meal very well. She says: Can I just say first that I love transparent bowls like these? *points to the photo* SO NICE. Anyways, the side dishes were yummy. All freshly made and refillable. Yums. Andrew says: Lovely side dishes, tried them all, favorite would be the anchovies. Ee Lynn says: Side dishes were mind boggling and tasty! again, different from other restaurants. James says: The lovely thing about korean food is the side dishes. Served all the time and refillable! just pick your favourite and dig away. Grab some chicken, mix the side dishes in ( don't know their names) and wrap it up in your lettuce leaf and munch away. Jelissa says: They all looked good, nicely presented in classy glass bowls. Somehow they all taste pretty much the same. 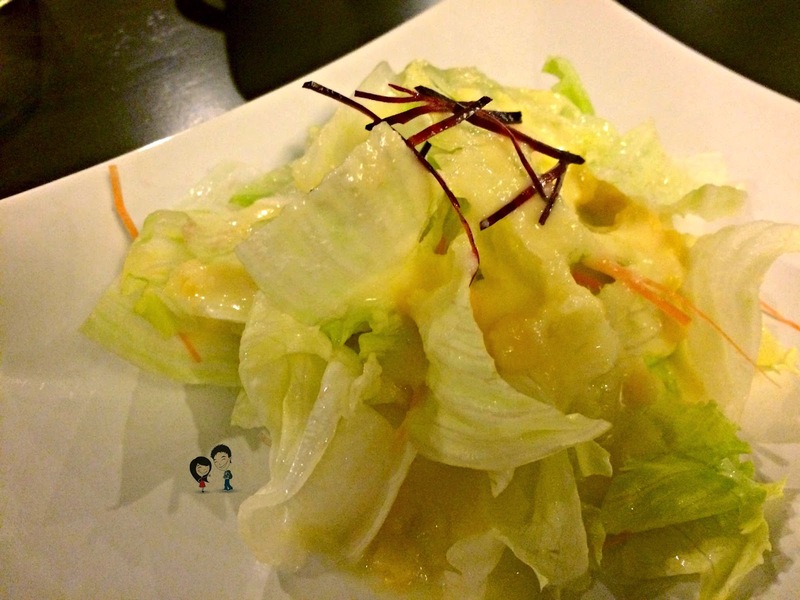 Melissa says: The side dishes offered were different from other restaurants. 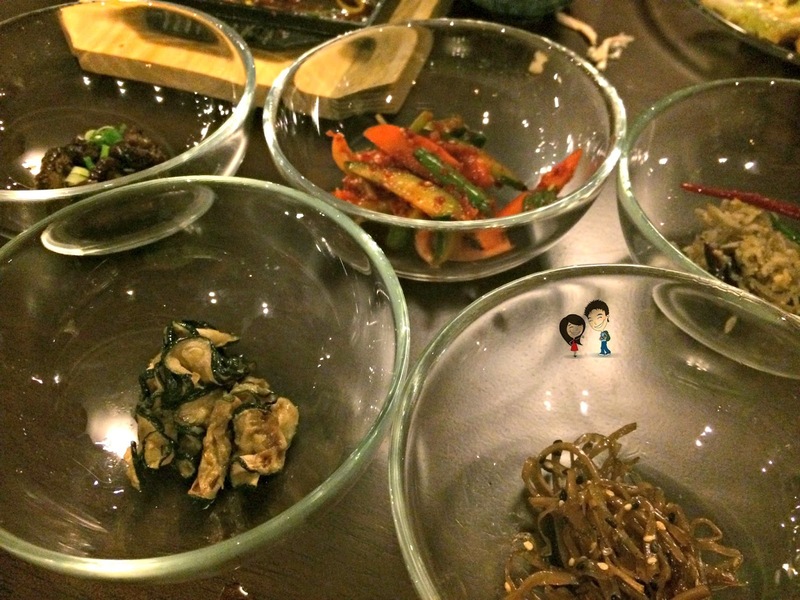 Tracy says: Korean food is never complete without their side dishes. My favorites were the anchovy and eggplant dish. He says: Ini best, another dish which is on the must try list! She says: Soybean paste is mixed according to your level of spicy preference. Mix all the vegetables and you get yourself a pot of goodness! For vegetable lover like myself, gotta love this one! Andrew says: At first glance the dish doesn’t appeal to me, maybe cause its just rice with a lot of different veges and I am not a vege fan. But after Alice helped us to mix it with the chilli paste, It looked so appetizing that I had to try it. There wasn’t much to say after I had the first spoon. Lets just say I kept eating till I couldn’t eat no more. Ee Lynn says: Love that they serve it in hot stone bowl. very nice.. could use an egg on top! 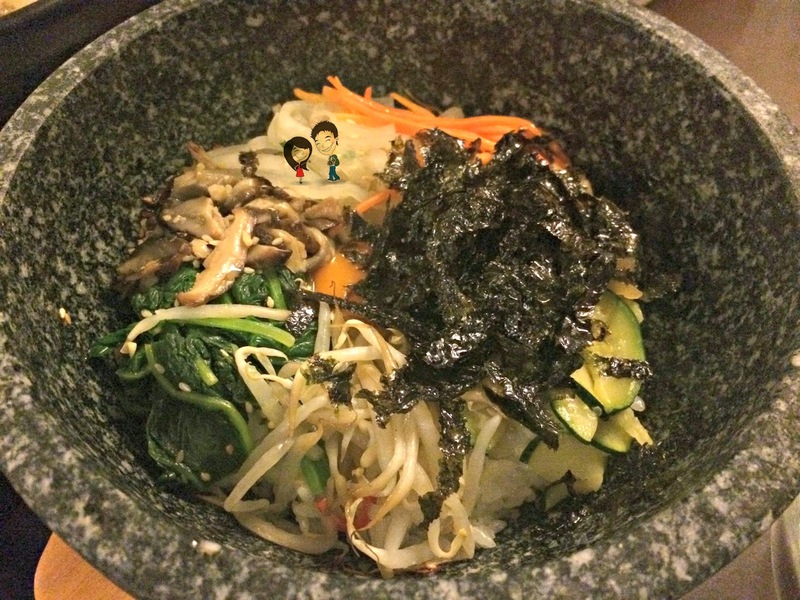 Jelissa says: I was never a fan of bibimbap. Basically plain vege + rice. But this one is very interesting. Perhaps it's the chili paste that makes all the difference. Owner was nice enough to mix for us, so the rich was not overly cooked/burnt on one part of the hot stone bowl. In fact, I find the crunchy part of the rice pretty addictive! Thumbs up for this one! Melissa says: Felt the bibimbab was acceptable. Nothing outstanding about this dish. Tracy says: One of my favorites! Truly an authentic korean bibimbap. Love the crunchy rice at the bottom. He says: KIM CHI! Hot enough and it was just right! Yummyy! She says: ANOTHER FAVORITE OF MINE. Though its a bit too sour for my liking, I still love the flavor to the soup. Love digging into the soup to look for the treasures inside. Heh. Andrew says: No idea if it’s just me or this is a very unknown kimchi soup to me. I have tasted a lot of different kimchi soup, it is usually sour or too spicy for me but this one was just perfect to me. Usually I would have started sweating after the third spoon but for this one, i could drink it all day. Ee Lynn says: POWER. spicy and sour.. super "open appetite" HEHEHE! James says: KimChi soup... if only there was ramen in it. Very balanced in taste I must say. IT isn't too sour or spicy. Jelissa says: Very interesting. 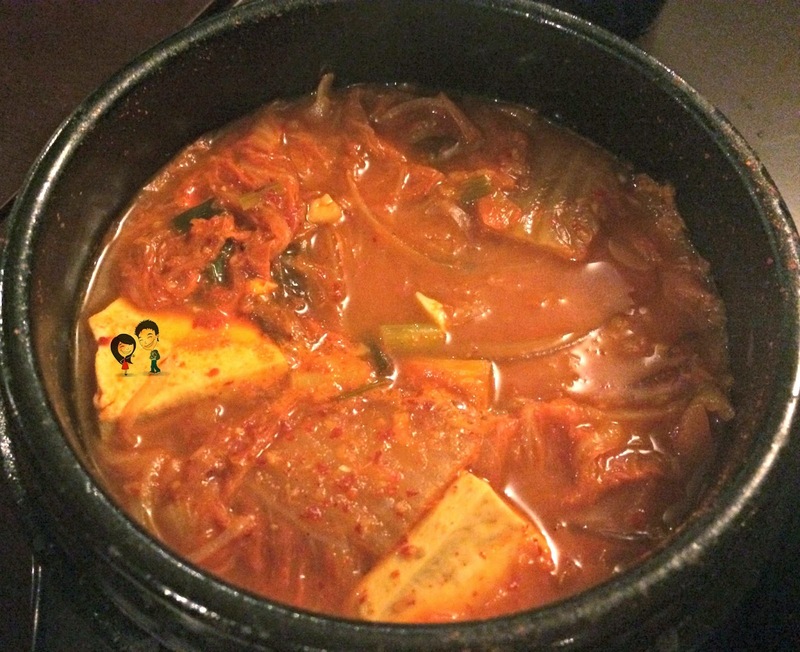 I've always been a fan of kimchi soup and this was one of the best I've ever tasted! Not too spicy, vege, tofu, meat etc not too soft(overcooked?). Looks appealing too! Haha! 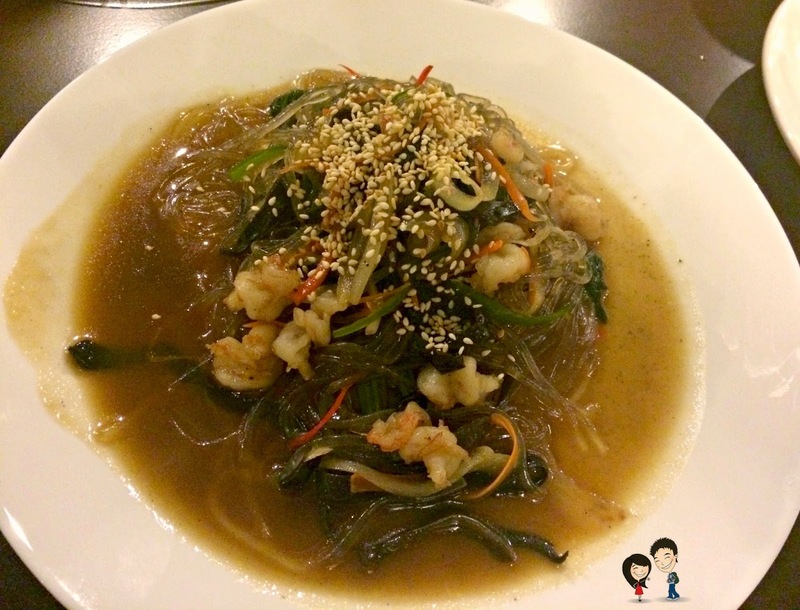 Melissa says: It tasted like really authentic kimchi soup, plain and comfortable. Tracy says: Good balance. Some might find it abit too sour but I like it. He says: Pear and "chocolate ang ku koay"! Not badd..
She says: Took one bite on the red bean jelly and didn't like it because I'm not a fan of red bean at all. So for those who loves red bean, you'll find this dessert just perfect. It's not overly sweet. Ee Lynn says: CHOCOLATE and pear. lol. red bean and pear was a good light end to the satisfying meal. James says: Pear and jelly for desert. Who could ask for a better pallet cleanser than that. although I wish there were more pears on the plate. Jelissa says: Pear was well, usual. I do enjoy the red bean ones though. Not too sweet. Smooth texture, authentic red bean taste. Red bean lovers ought to try! Melissa says: Not bad. But nothing too great about this. Tracy says: Somehow it reminded me of malaysian 'dodol'. It came in a tiny portion but i didn't mind because I was already so full by the time we got to dessert! 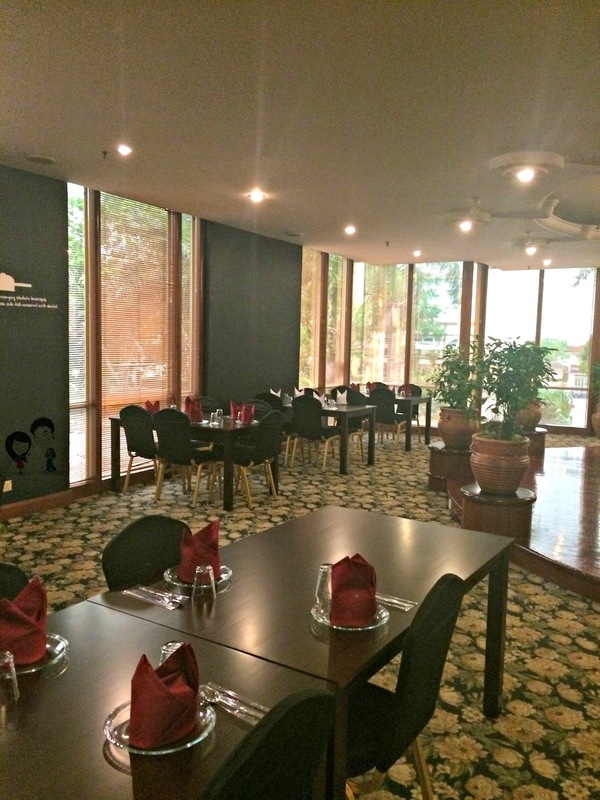 Call 017-519 3221 to make your reservations! You can follow them and like their FB page!